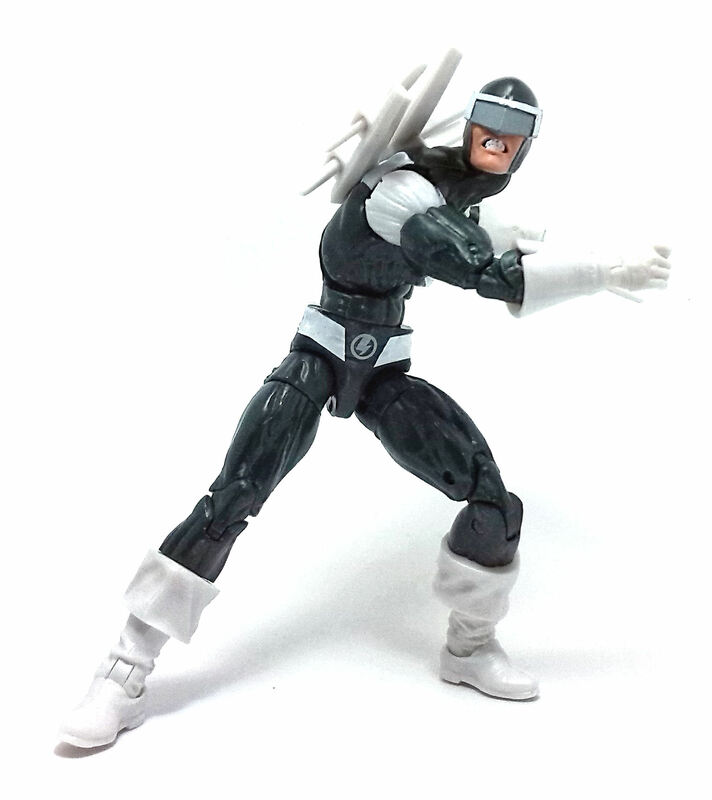 Boomerang was released as part of the Marvel Legends assortment scheduled to promote the second Amazing Spider-Man movie in 2014. 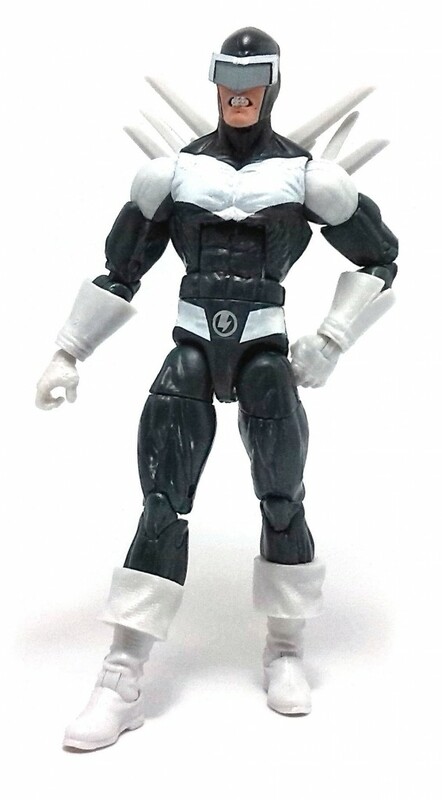 However, the character does not appear in the film and this action figure may not even appear at some store locations. That’s because Boomerang here is a character variant, sharing the same spot in the line with Beetle, another of Spider-Man’s foes. So, you may be able to find either one, but not necessarily in the same numbers. Boomerang seems to be the easier to produce of both villains, as he is constructed using the more recent medium male buck. 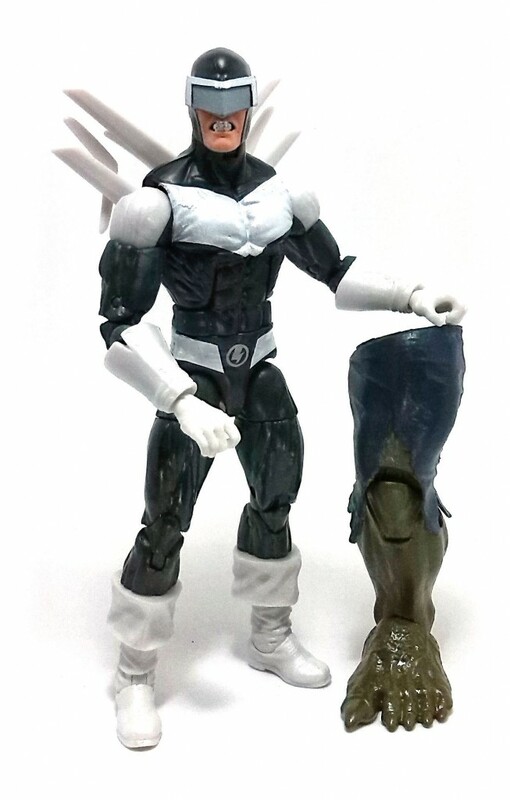 There are a few generic extra pieces used to complete the costume, like the glove cuffs and the flared boots, but only the head is actually a new sculpted piece. 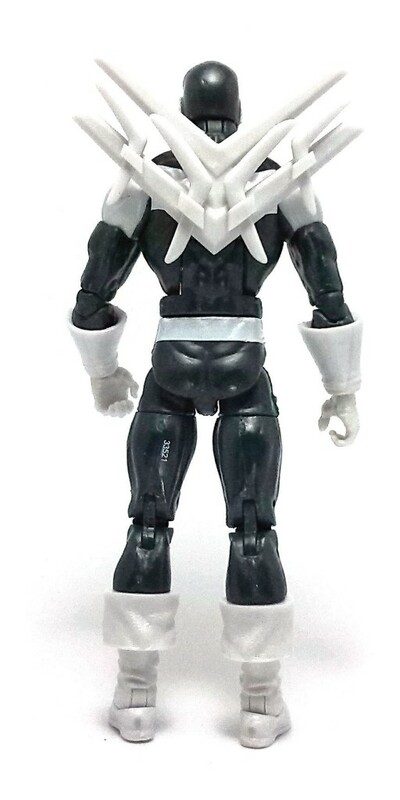 Most of Boomerang’s face is covered with a cowl and visor, but the exposed mouth shows a fair amount of expression that makes for an interesting contrast with the smoothness of the surrounding area. 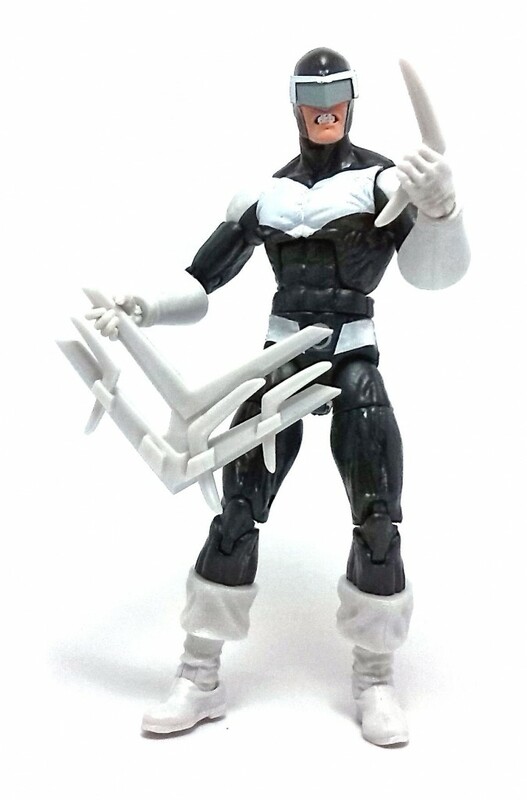 This articulation design gives Boomerang a very dynamic range of movement and each joint feels firm enough to hold most poses without problems. The paintjob on Boomerang is deceptively simple, as most of the figure was made in the final color of plastic. The darker pieces are made from a very dark green plastic, while the gloves and boots are made from a pearly white material. The bands on the his torso and waist are painted on and the color matches very well with the light colored plastic, but sometimes the paint does not go deep enough into the muscle crevices of the figure, although the edges are neat. The head has a little more variety with the skin tone applied to the lower half of the face and the greenish gray visor application. The figure comes equipped with two pairs of different-sized boomerangs and an attachment to carry these projectiles on his back. 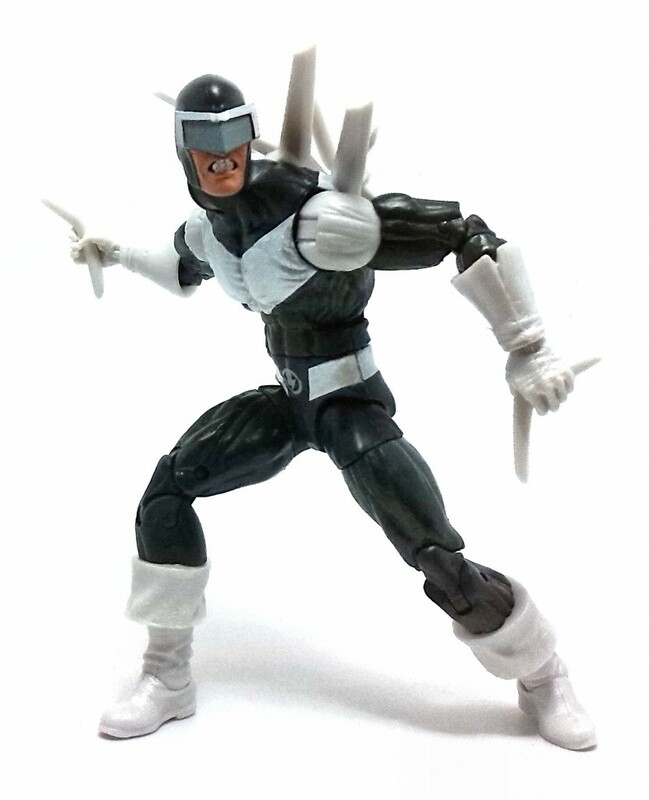 These weapons and the holster are made from the same pearly white plastic used for the gloves and boots of the figure. Boomerang also includes the left leg required to build the Ultimate Goblin. The piece is a retooled Avengers Movie Series Hulk leg, molded and decorated in different colors. Overall, I was quite pleased with Boomerang. The figure looks nice, poses well and comes with a fair amount of suitable accessories. I love the picture at the top of the page!